Preston Grasshoppers make the first of two back-to-back trips “across the border” tomorrow when they travel to Otley – followed a week later by a visit to Wharfedale. With Scott Jordan facing time out with ankle ligament damage, Brad Cave makes his first start at full-back for Hoppers. Jack Edwards comes into the back-row, with Ally Murray moving up to lock, and Alex Ward is on the bench after a week on loan at Rossendale. Following last week’s abandoned home game with Kirkby Lonsdale, Vale of Lune travel to Ilkley. They make three changes to the starting XV which was leading Kirkby Lonsdale 15-5 when the game was called off due to the injury to a visiting player. The game has been rescheduled for next weekend. 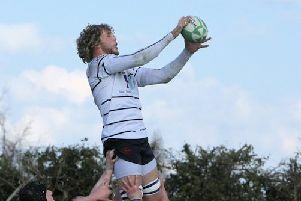 Charlie Lomas is a t fly-half, Callum Kyle in the second row and Mike Bradshaw at lock. Fylde take on Sheffield Tigers at Ansdell. Hoppers: Cave; Spence, Stott, Fitzpatrick, Trueman; Davidson, Gough; Mabaya, Millea, Altham, Procter, Murray, Edwards, Trippier, Lamprey. Replacements: Wilkinson, Johnson, Arnold, Squirrell, Ward. Vale: J Dorrington; Jacques, Owens, B Dorrington, Hall; Lomas, Swarbrick; Bradshaw, Powers, Pillow, Kyle, Fellows, Robinson, Ayrton, Wallbank. Replacements: Tagg, Hunt, Higgin.